More than ten years after the adoption by the Council of Europe of the Convention on Cybercrime, the European Commission finally presented a proposal for a cybersecurity strategy. It is aimed at national and international key actors and plans on a decentralized system for the defense of cyberspace that goes beyond national borders. The discovery of ultra-powerful virus such as Stuxnet or Red October gives an idea of the potential threats lurking in cyberspace. 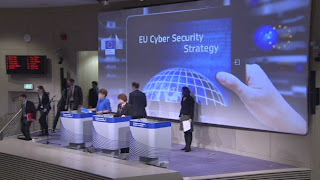 The Commission finally takes the subject through Neelie Kroes, Vice-President of the European Commission, Cecilia Malmström, and Commissioner for Home Affairs, Catherine Ashton, High Representative of the Union for Foreign Affairs and Security Policy, who just published a joint strategy for cyber security of the Union. • a coherent approach to the European Union cyberspace and spreading the fundamental values of the EU. The strategy must now be implemented by Computer Emergency Response Teams (CERT), which Member States should put in place where they do not yet exist, to identify digital threats through cooperation, analyze and fight them. Member States should also establish national agencies and network security information (NIS), which will develop a common strategy and work together. Member States will be supported by the European Agency for Network and Information Security Information Security Agency (ENISA), with the transfer of information and expertise within the States of the Union. The private sector must also be integrated in this process, due to its expertise in computer skills. According to the Commission’s document, a “public-private partnership for effective European security of information systems” would be a suitable instrument and should be built. The European Union also continues to practice since 2010 cyber exercises for the Member States and the private sector. The strategic approach particularly emphasizes the need for cooperation between the European Union and its Member States with relevant international organizations, such as NATO, the OSCE and the European Defense Agency (EDA). This cooperation, the use of improved technologies and a better understanding of attacks should thus enable a better defense of the cyberspace. On the judicial side, the European Union has recently opened the European Centre for the fight against cybercrime (EC3) in The Hague, which aims to help investigators in each state to develop their skills in the fight against online crime and will induce cooperation between authorities. In this quest for a better cybersecurity, the European Commission insists on the fact that this should respect the values and fundamental rights of the Union, without the use of tools or general supervision of censorship. The Commission will strengthen and encryption methods and allocate the necessary importance to “dual use”, that is to say the use of goods and technologies for different purposes. The European Union is looking for a free, open, safe and more secure, but this move towards a better Internet security still needs to be put in place. To surf safely, the best solution is to choose a VPN service. Its technology allows you to establish an encrypted VPN tunnel to a host (or server) on the Internet. You can surf anonymously, without limitation, as it is impossible for others to intercept your traffic because of the VPN server. Your Internet activity is undetectable. The VPN installation takes only a few minutes and ensures you surf, do your shopping on the Internet or download any content you want, safely.